Keeping your plants safe and happy throughout the year requires a fair amount of maintenance, from pruning in the early spring to fertilization seasons and keeping roots well-protected from winter’s chill. 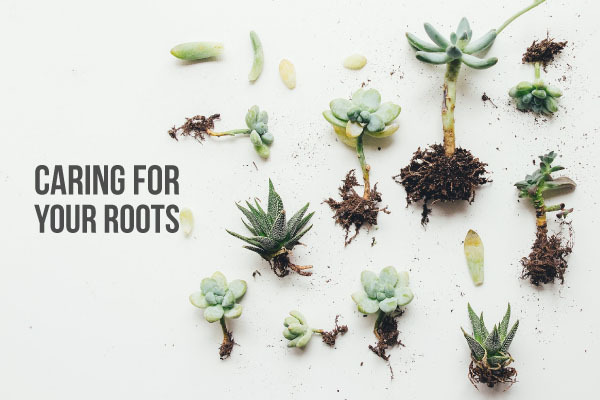 The roots of your outdoor plants can take a lot of variation, from flooding to drought, but they do need the proper support to stay healthy in the long term. These tips will help you keep your landscape looking beautiful through the ages. When you plant trees and shrubs, proper root care allows them to recover from the shock of transplantation and begin a vigorous growing season more quickly. Protect the roots of new plants and trees with three to four inches of mulch surrounding the plant. Keep in mind that the mulch shouldn’t touch the trunk, but will provide the roots with an excellent growing medium as it decomposes. Moisture levels stay more constant, even without consistent watering schedules. Creating a lush, green lawn throughout the spring, summer and fall months starts with 4 simple tasks: adequate aeration, moisture, and fertilization — all targeted to feed those lovely roots! In the fall, aeration breaks up large clumps of dirt that can make it tough for tender grass shoots to break through while allowing nutrients and air to reach deep down to the roots of your grass. When you’re developing new landscape elements, it’s essential to keep the current plants and trees in tip-top condition through regular maintenance. Spring and summer are prime growing seasons for trees, plants, and shrubs, but the roots can be the first to suffer from the stress of rapid growth. Fertilize your root systems on a regular basis — four times a year is recommended — to ensure that they stay strong and healthy and continue to provide you with lush foliage throughout the years to come. Ready to get your dig on and create a lovely new landscape for your home or office? Contact Landscape by Design today at 817-355-1013 for a free consultation, or visit us online to learn more about creating the outdoor living space of your dreams.